This week sees the publication of another exciting debut by an author with whom I’ve worked closely as mentor and structural editor. 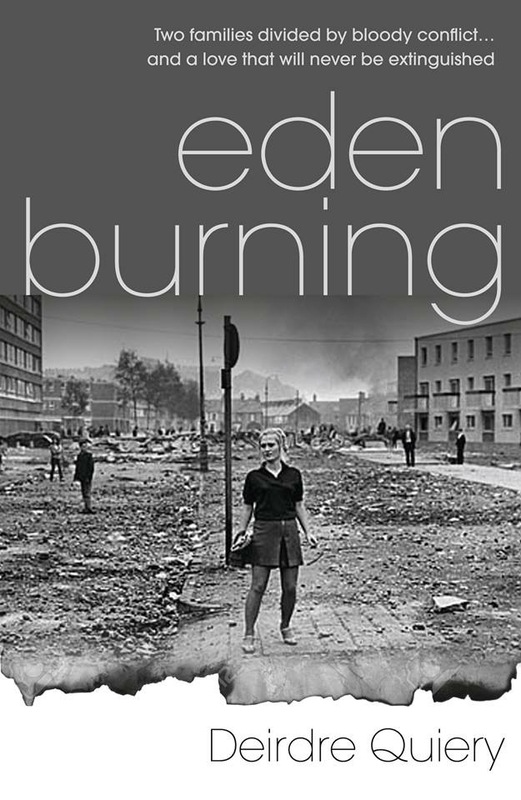 It was a pleasure to work with Deirdre Quiery on Eden Burning. Set in 1970s Belfast, it traces the story of two families riven by conflict and yet, in the end, brought to a redemptive resolution. This might make it sound more like Romeo and Juliet than it actually is, though love is a vital element of the book’s message. It’s a hugely evocative read: pacy, atmospheric and with characters that appeal with their strident voices and strong sense of purpose. 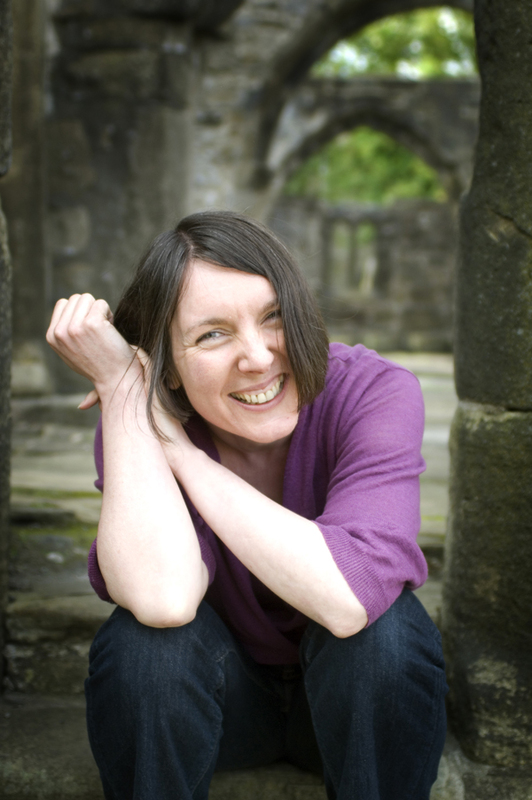 In fact, the writing is underpinned by a strong sense of spirituality, something that is a key component of Deirdre’s creative practice. I’m looking forward to working further with Deirdre on her next novel, which is a companion piece to Eden Burning. Here, in the meantime, she talks about her debut novel, her writing process and the importance of home in a Mallorcan olive grove. How do you juggle writing with other work? It’s a great question. 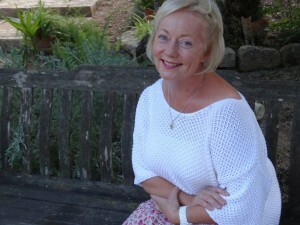 I work as a Leadership Consultant delivering workshop around the world on topics such as Coaching, Leading a Team, Conflict Resolution and Leading Change. These workshops are within the corporate world and a normal day where I am delivering would mean getting up at 5.30 am – the workshop finishing at 6.00 pm and sometimes the evening is spent having a dinner with participants which means I only get back into my bedroom around 10.00 pm. On days like these there is no space to write – so I don’t try. However, I always have a journal with me – a notebook stuffed into a rather large handbag. This is where in spite of the business of the day I record before going to bed, impressions of the day – what has caught my attention or impacted my emotional world. Perhaps it might be the staff in the hotel, participants or something happening in nature. In this way observation of the world is still happening. This may be the seeds for something later in writing. For example, this morning in the hotel at breakfast I saw an elderly man peer into the breakfast room. He looked around and then walked away. He returned. I watched him. He seemed confused, uncertain, almost afraid. There was something about him which reminded me of my father who had dementia – a great vulnerability. I began to think of Paddy who is a character in my second novel “Gurtha”. Paddy has dementia and I wondered what this new stranger could teach me about the vulnerability and gentleness of Paddy. I found myself getting up from my seat, walking towards the door to find him. There he was hovering about outside, looking lost. I walked up to him and asked, “Can I help you?” He looked at me with a smile that would melt an iceberg and said, “I’m only waiting for friends who are coming down to breakfast at nine. I’ve been up from seven.” There was something in that encounter which definitely will impact in “Gurtha”. So although I’m not writing as such, I am observing and allowing my heart and mind to be touched by the world around me. However, I have the fortune of being a freelance Consultant and that means on other occasions I may have an entire week without having to travel or to deliver a workshop. In those days I am very disciplined about writing. I still get up early (not at 5.30 am!) around 6.30 am. I have a coffee, go for a one hour walk in nature, when I think about the characters and plot in the book. I also drop that from time to time and try to experience the beauty of nature without thinking about what I am going to write. I come home and do 30 minutes of meditation – emptying my mind of all thoughts. Then I set an alarm clock for 2 hours and write. I have a second coffee and set the alarm again for two hours. I like to write between 1,000 to 1,500 words if I can. However, the next day I may delete half of those! So the juggling of other work comes with seeing work as possible inspiration and being very disciplined about writing in the days when I have no formal work. You grew up in Belfast during the Troubles and so inevitably Eden Burning is influenced by your own experience. Can you tell us about the process of sifting that goes on when you take material from ‘real life’? What remained the same and what did you choose to fictionalise? I think this is a very significant question for a writer. My characters are definitely fictional. I believe strongly in the importance of this. However, it is also true that real life sparks the creativity for the creation of characters, plot and dialogue. I tend to take an essence of something and then use this as the base to create the scene. For example in the character of Lily there is an essence of my Aunt Muriel who I loved. She had a great sense of humour. However, Lily is no way like my Aunt Muriel – if you were to meet them both you would know they were very different people. That’s one of real fascinations of writing – you really get a sense that you are bring someone complete new to life. Of course they have touches from the past – just as we all do with our DNA – but we are unique. We are not copies of our parents. Where it is a scene which has moved me in real life – it works in the same way. In real life our house was taken over and someone was killed in crossfire – but the characters created around that are all fictional – Ciaran, Lily, Tom and Rose. So I allow whatever has moved me from a person’s life to inspire the characters, plot and dialogue. I feel this is in some cases an honouring of their spirit which can go unrecognised in life. However, my characters, plot and dialogue have to be authentic in standing alone in their unique creation. There’s a strong spiritual strand to your work. By this I don’t just mean that you construct characters who subscribe to organised religion but that you want to get under the surface of the material and the everyday. Can you say a bit about how this is important to you? Yes. It is true. I see a difference between spirituality and religion. Religion if not accompanied by an inner spirituality can lead to fundamentalism. However, I believe that there are different ways of experiencing the world. There is a level where we see things as objects with which we relate to and we either like them or we don’t. This includes seeing people as objects – sometimes to be used. You might call that a level of ego experiencing the world. There is another level where we see the world as it really is. I would call that a seeing with the “heart”. In that seeing we see the interconnectedness of everything. We don’t see separation but oneness. That for me is the spiritual connection – to know ourselves connected to nature, to others and ultimately to our Source – that which has created us and holds us moment by moment in being. I think our lives are journeys to drop deeper and deeper into experiencing this oneness. In my writing I like to explore how that might be possible with the key characters and what gets in the way for them – which is also an important part of being human – failing along the way. I have a lot of sympathy for failure and respect for keeping going! I have always been interested in what’s “real” and “the truth”. Our school motto was “Truth in our hearts”. In Northern Ireland during “The Troubles” I remember thinking that you didn’t know what was real. It was very confusing what to believe. What’s the best thing about being a writer? And the worst? The best if feeling that I am doing something that I was meant to do. I write and I don’t know whether anyone will like it and yet I feel as though I am meant to be writing. I have always felt that I wanted to be a writer. The worst is the thought that maybe I’m deluded! The doubts flood in from time to time that maybe I shouldn’t be writing. But then I can’t think of anything else which would fill the gap. Can you tell us a bit about the initial stages of your writing process – how you capture your ideas and how you tackle the first draft? Eden Burning went through at least three drafts. I started the first draft by looking through journals I had kept for over 10 years. These journals contained thoughts, clips from what inspired me in my reading, writing poetry and dreams. The first draft almost had a business feel to it. I called it “Beyond Vision and Values” and it was designed as a new paradigm for leadership in the corporate world. After I had written it, I knew that I wanted to write fiction. So I did nothing with the first draft other than have it printed off and filed it. I then began the second draft which I called “My Favourite Flower is a Diamond”. I created a plot and characters and began to create fiction. Although it was rough writing, I knew this was what I wanted to do – to write fiction – not business books, not autobiography. I booked myself on an editorial workshop and started to study the art of creating plot, characters and dialogue. How do you feel about the editing process? Do you love it or loathe it, and why? I found it really helpful to receive feedback from you. This motivated me in carrying out the editing process. I felt exhilarated at pressing the delete button and seeing the book start to take more of a concise shape. With your help, I learnt the importance of editing and enjoyed it. You encouraged a “no fear” approach to the initial writing and a “no fear” approach to the editing. Having a positive attitude and support made the process motivational. Where do you like to write best? At home in Mallorca, sitting at my desk, surrounded by the cats and staring into the beauty of an olive grove. Who is your most significant influence (literary or otherwise)? When I was younger I liked Ernest Hemingway, D H Lawrence, Graham Greene. Today I like John Banville, Margaret Atwood, Julian Barnes, Iris Murdoch, Peter Carey and J M Coetzee. I also like to read the writings of John Main – a Benedictine monk. I find that if I really like an author I want to read everything they have written. I remember doing this with Enid Blyton and feeling that the world would never quite be the same because I had read everything she had written. Where would you like to be in five years’ time? And in ten years? Please could you tell me? I would like someone to tell me! I have made changes in my life based on the fact that I was too happy and thought that I needed to expand my range of experience and suffer more. I think that I have done that and so I am quite happy to going back to being happy! As you mentioned before I have a spiritual perspective and keep praying for guidance as to where I should be rather than where I want to be. No answers so far that I can interpret and so I stay where I am. If you had one piece of advice to give to your fifteen year old self, what would it be? Be more disciplined and say nothing at times (may not so good for a writer!) But didn’t Samuel Beckett say something about there is nothing to say together with the obligation to say? I would say to my fifteen year old self – see the value in silence. Eden Burning is published by Urbane Publications and is available for purchase here from Urbane, here from Amazon and here from the independent publishing service, Compass. 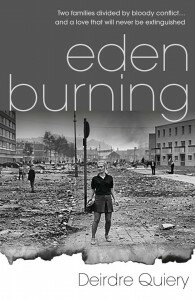 Read Deirdre’s account of ‘the making of’ Eden Burning on the ‘A Lover of Books’ blog and her article on the background to the novel on www.writing.ie here.